Whether you live in the SF Bay Area or you’re visiting, there are plenty of options for getting to the Cherry Blossom Festival, located in the heart of Japantown. We highly recommend that visitors take public transportation or use a rideshare service as parking will be limited during the Festival. Whichever method you choose, please add extra time for traffic, parking, and/or walking to the Festival area. Check 511.org for directions, the latest traffic, and road closures. Plan out your route with Google map or Apple Maps. Important: Bear in mind that Post Street, between Laguna and Fillmore Streets, and Webster Street, between Geary Blvd and Sutter Street, will be closed to vehicle traffic. 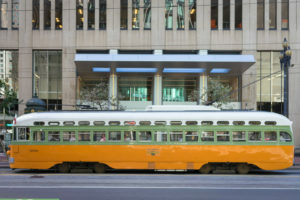 If you are coming to Japantown via Muni or BART, the easiest and most direct route is to transfer at Montgomery Street Station and catch the 38-Geary on Market Street to the Fillmore and Geary bus stop. Muni has bus stops just blocks away from the center of Japantown. Bus routes should not be impacted by the Festival, but we recommend checking on delays and ETAs for your bus (online resources include NextBus, the SFMTA website, and 511.org). From Union Square: Take the 38-Geary bus from the Geary/Powell Street stop, and get off at the Laguna or Fillmore stop. Alternatively, take the 2-Clement or 3-Jackson bus from Sutter/Powell Street stop, and get off at the Laguna or Buchanan stop. From the Marina or Dogpatch districts: Take the 22-Fillmore bus, and get off at Fillmore/Sutter Street. From Fisherman’s Wharf: Take the F Streetcar line to Market and Drumm. Take the 2-Clement bus and get off at the Laguna or Buchanan stop. From the East Bay: Take any Daly City/Millbrae bound train and get off at Embarcadero Station. Hop on the 2-Clement bus at Steuart and Market Street (Ferry Plaza), and then get off at the Sutter/Laguna Street stop. From Millbrae: Get off at Montgomery Station, then catch the 38-Geary bus to the Fillmore/Geary stop. Alternatively, you can walk to Sansome and Sutter Streets from Montgomery Station, then take the 2-Clement or 3-Jackson bus and get off at the Sutter/Laguna Street stop. From South Bay: Transfer at Millbrae to BART. Get off at Montgomery Station, then catch the 38-Geary bus to the Fillmore/Geary stop. Alternatively, you can walk to Sansome and Sutter Streets from Montgomery Station, then take the 2-Clement or 3-Jackson bus and get off at the Sutter and Laguna Street stop. Tell the driver to drop you off on Geary Blvd at the intersection of Webster St, just past the Japan Center Garage. There will a drop off zone designated for Rideshare & Taxi Companies. Please note that this zone is for drop-off or pick-up ONLY. Cars will not be able to idle in this area and will be asked to move if passengers are not present. Do not request a ride until you are at the designated pickup area. If you’re using City Car Share, Getaround, or Scoot, there will be a few spots available for each service in either the main garage (1610 Geary Blvd) or the Annex (1650 Fillmore St) parking garages. However, be prepared for these spots to fill up very quickly. Plan your bicycle trip to Japantown using Google Maps or Apple Maps. Once you arrive, there is limited Free Bicycle Parking available at the Japantown garages. *Bicycles are not allowed to be locked up to meters, trees or barricades in the festival grounds. The City of San Francisco’s Japan Center Garage Corporation is a nonprofit public benefit corporation organized for the express purpose of assisting the City and County of San Francisco to provide oversight of the Japan Center Garages. For hourly rates and more information visit the Japan Center Garages Information page. Rosa Parks Elementary School PTA is hosting a Parking Lot Fundraiser on April 13, 14, and 20. The parking lot entrance is on 1400 Ellis Street (cross street is Webster Street), only a few blocks from the Festival. All day parking is $30; after 2 p.m. is $20. The lot opens at 10:00 a.m. and closes at 7:00 p.m. They will have volunteer parents and community members on site at all times, and ALL PROCEEDS fund the school community including science camp, field trips, and teacher support. Support your community and get hassle-free, convenient parking!